In the 90s, Pete would encounter a product that would set his company toward an illustrious path. While visiting Australia, Pete saw big vases made from casted cement. “This can be done in the Philippines,” Pete recalled thinking at that time, “ wala pang gumagawa nito .” He proceeded to study the technology before developing the material using stones found in Cebu. 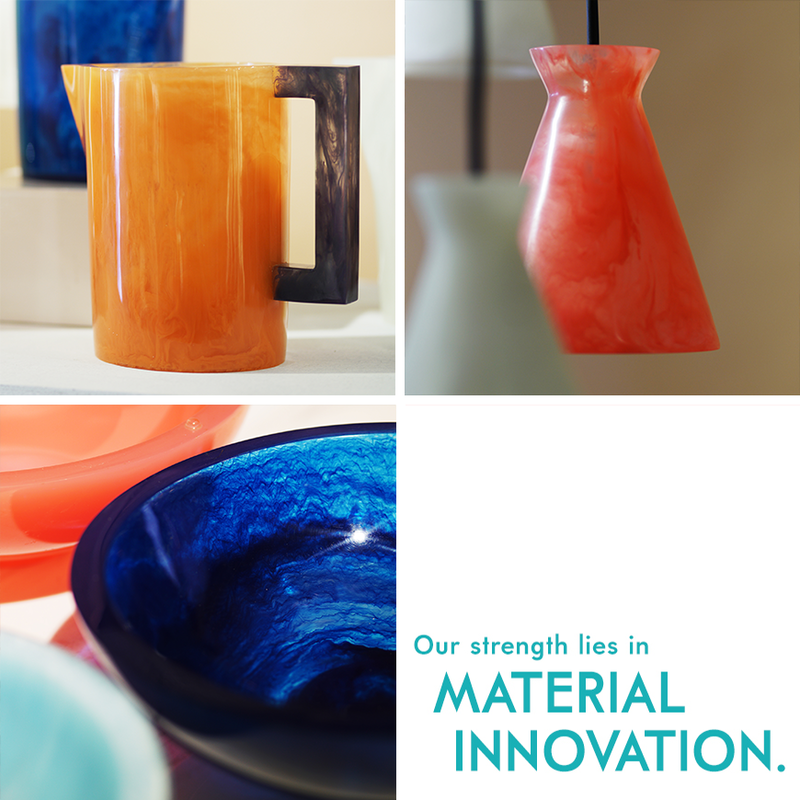 The pitcher, bowls and drop lights are made from Marmorcast, one of four patented materials developed by Nature’s Legacy. Pete applied for the product’s US and Philippine patents in 1996, “ para ma -claim natin ,” he said. In the coming years, he and his wife would go on developing new materials under his a new company, Nature’s Legacy, and gain recognition from both local and foreign award-giving bodies. 2013 was surely a high moment with Pete’s Naturescast (made from agricultural debris) recognized as an outstanding invention by the Dept. of Science and Technology. That distinction enabled them to quality for foreign competitions, including the 43 rd International Exhibition of Invention in Geneva, Switzerland where Pete’s Naturescast was awarded the gold prize. 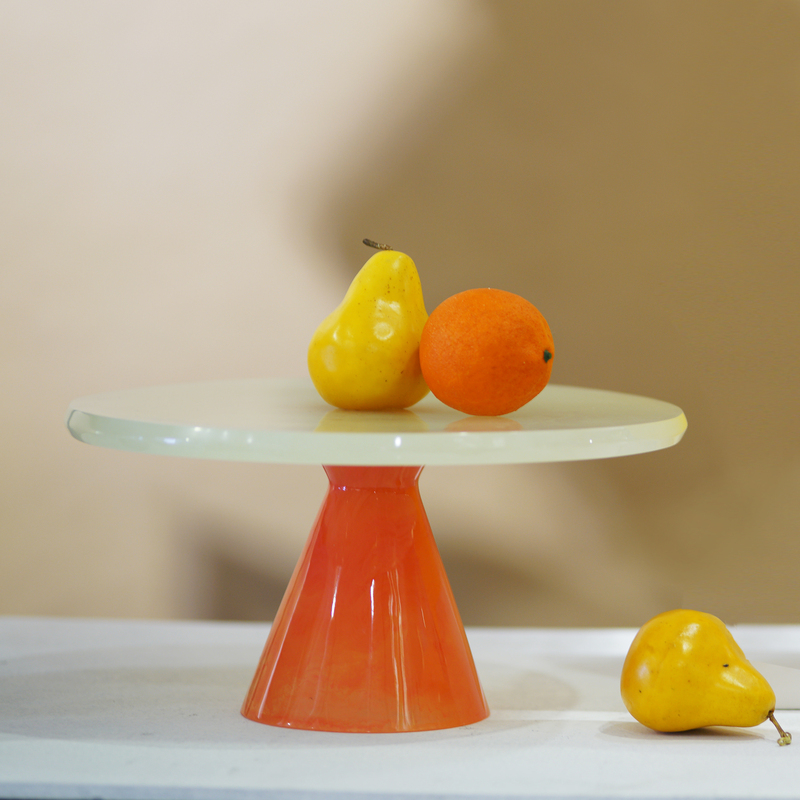 The cake stand was developed for a buyer who wanted to recreate the warmth of an old English kitchen . To date, Nature’s Legacy boasts of four patents: Brauncast, which is made from crushed stone, the agro waste-based Naturescast, Nucast, which comes from recycled paper products, and the synthetic mixture called Marmorcast. “Our strength lies in material innovation,” Pete proudly disclosed. All of the materials are popular with different clients, but Naturescast and Marmorcast were undeniably the stars at Manila FAME October 2018. “They like the Naturescast wall art because may s tory,” explained Pete, “so may homeowners, hotels and even a buyer in California who were interested.” Marmorcast drew a different clientele. “What triggered the sale is the nostalgic effect,” said Pete. He used the material to create pitchers, cake stands and drop lights. The pitchers and cake stands were developed for a particular client who wanted to bring back the warmth of an old English kitchen. 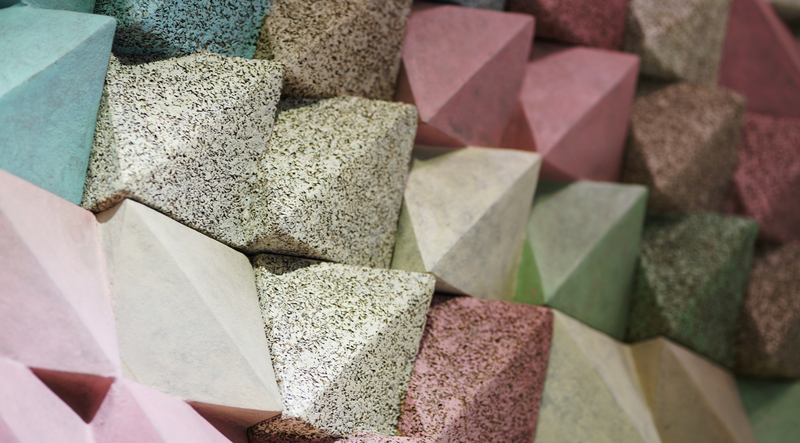 A wall installation made from the Delantars’ award-winning material, Naturescast. According to Pete, they were able to ship some Marmocast orders by air in time for his clients’ holiday sales. There’s more good news with the launch of Marmorcast items in Bloomingdale’s in the US, in addition to the boutique stores that already carry the line. Top photo: A row of Marmorcast pitchers that debuted at Manila FAME October 2018.